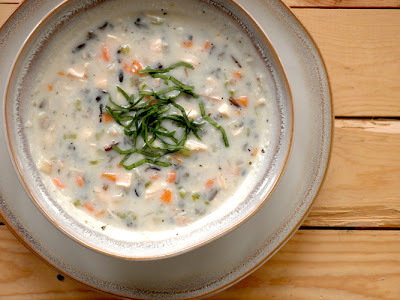 I had half of a Sam's Club roasted chicken that I need to use for dinner last night, so I looked up "chicken and rice soup" recipes and I landed on a on Taste of Home. I changed it up a little bit because I had leftover white rice from White Chicken Chili the other day, and then I cooked up some wild rice too to make it a little more interesting. (The original recipe calls for uncooked rice.) I was pleased with the resulting soup, but I can't say it knocked my socks off. It's a good, hearty soup, but it needs a little something more. Perhaps I'll try it again sometime, but now that I think of it, I think what it might need is just a little more salt, which is something I need to avoid, so... we'll see. At any rate, if you have leftover rice and chicken, this is a quick, tasty meal. There you go. In a large saucepan, heat oil and saute onion, carrot, and celery until tender. Add garlic, pepper, and basil, and cook another minute. Add flour and cook another minute, stirring constantly. Pour chicken broth in slowly, stirring constantly to avoid lumps. Bring to a simmer and add cooked rices, half and half, and chicken. Bring to a simmer again and simmer for 5 minutes. Add salt if desired. Store leftovers in the refrigerator. You might need to add some milk when enjoying the leftovers. P.S. The green garnish in the photo is just julienned spinach leaves. I didn't have anything else to garnish it with, and I needed something to brighten it up.